La Flûte de Pan is arguably Jules Mouquet's best known work. 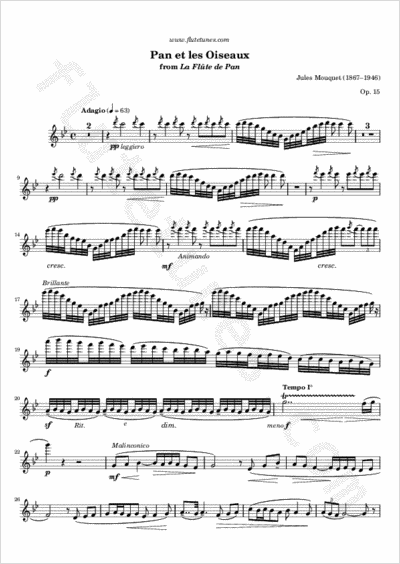 Originally written in 1906 for flute and orchestra, it was also arranged by the composer as a Sonata for flute and piano, and cataloged as Op. 15. Like Debussy and many other French composers at the turn of the century, Mouquet favored subjects from Greek mythology, as a sort of neoclassical reaction against the adoption of Norse legends in Wagner's operas. During the three movements of La Flûte de Pan, the cloven-hoofed Pan, the Greek god of shepherds and their flocks, is heard playing his flute in amorous serenades and lively peasant dances. “Pan et les Oiseaux”, which is French for “Pan and the Birds”, is the title of the second movement from the sonata.